Learn SQL — The EASY Way! 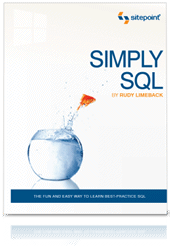 Weâ€™re very pleased to announce the latest addition to the SitePoint library, Simply SQL, by Rudy Limeback. Simply SQL is a practical step-by-step guide to writing SQL. Youâ€™ll learn how to make the most of your data using best-practice SQL code. Rather than bore you with theory, it focuses on the workaday use of SQL with common databases, and uses plenty of diagrams, easy-to-read text, and examples to help make learning SQL easy and fun. Grab yourself a copy of Simply SQL for just $34.95 or check out the free sample. SQL is a simple, high-level language with tremendous power. You can perform tasks with a few lines of SQL that would take pages and pages of intricate coding in a programming language. Itâ€™s the language used by all major database systems today and, although itâ€™s been around for about 30 years, is enjoying a renaissance in the 21st century, thanks to the tremendous success of database-driven web sites. Whether your web site is written in PHP, ASP, Perl, ColdFusion, or any other programming language, and regardless of which database system you want to useâ€”MySQL, PostgreSQL, SQL Server, DB2, Oracle, or any of the othersâ€”one fact is almost certain: if you want to have database-driven content, youâ€™ll need to use SQL. Whoâ€™s this Rudy Limeback Guy? Rudy Limeback is an SQL Consultant living in Toronto, Canada. His SQL experience spans 20+ years, and includes working with DB2, SQL Server, Access, Oracle, and MySQL. He is an avid participant in discussion forums, primarily here at SitePoint. His two web sites are http://r937.com/ and http://rudy.ca/.